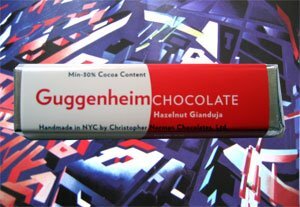 There’s really nothing remarkable about the Gianduja that I picked up at my visit to the Guggenheim, but it gives me an opportunity to talk about the Zaha Hadid exhibit. The work, which spans her thirty-year career as one of the world’s foremost architects is awe-inspiring and the spiraling structure of the Guggenheim, New York couldn’t be a more perfect backdrop. Born in Baghdad, Hadid represents as the first ever woman to receive architecture’s most prestigious award: the Pritzker Architecture Prize. A true visionary, she continues to reshape our world with her iconoclastic structures. If you need inspiration, this is a must see. While you’re at it, the gift shop offers this specially branded handmade chocolate bar by Christopher Norman Chocolates in Hazelnut Gianduja (30% cocoa content), Mocha Dot, and Bittersweet Crunch (bittersweet laced with cocoa nibs). At $6 for the same exact 2 oz. bar that sells for $4.50 on the Christopher Norman site, you’re pretty much paying for the keepsake.